In the last installment of the Gaps of Gay Street, we explored the Krutch Park Extension and all of the little retail spots that were once located there. 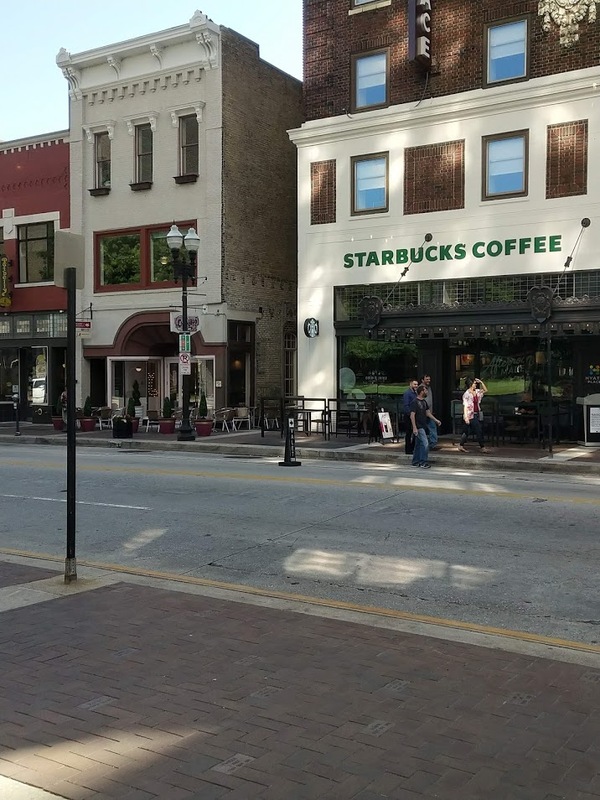 In this installment, we are going to take a quick hop across the street to explore the smallest gap on Gay Street. 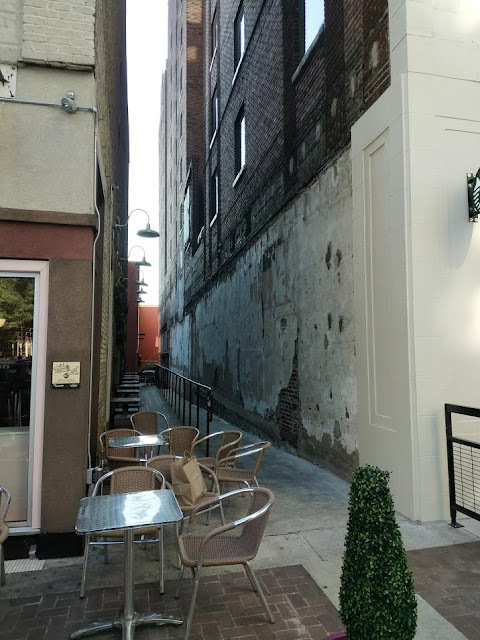 We're going to look into the alleyway between the building that now houses Coolato Gelato and the Farragut Hotel. Mind the gap between Coolato and Starbucks. Unless you're enjoying a delicious gelato, you've probably never even noticed this spot. It's not a terribly bad place to sit and enjoy a scoop. To the untrained eye, it would appear that this is merely an access way to the emergency exits coming out of the Regal Riviera or a convenient place to situate some cafe tables. One would be forgiven for thinking that, this gap is tiny. Tiny as it is, there is still a story to tell. Looking east, Regal Riviera in background. Note the plaster still on the wall. Perhaps unsurprisingly, the space began life as an alley. In the 1880's, two identical commercial buildings were constructed. One of those is no longer with us, having been swallowed up by the Farragut Hotel construction in the wake of the Imperial Hotel fire. 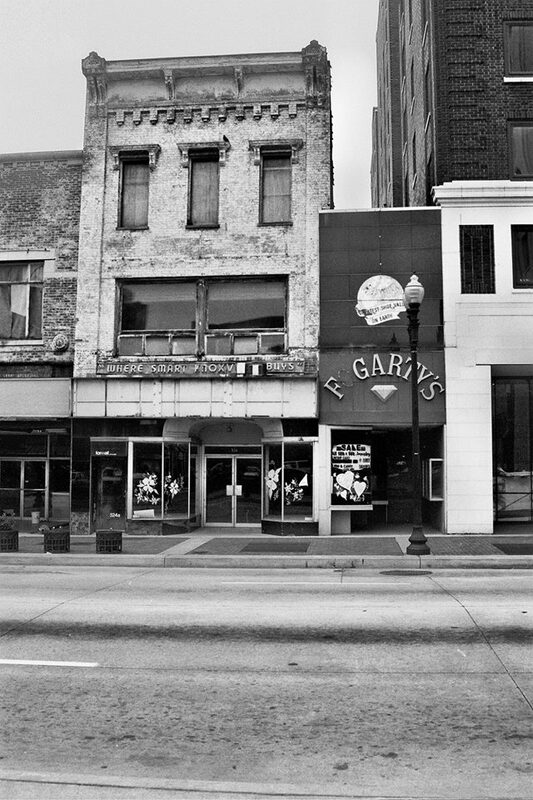 The other, the building to the north, still stands at 524 S. Gay Street. It is the building that houses Coolato. The northern building would become the Hotel Sterling (after doing stints as the Arcade Hotel and the American Hotel). In the beginning, the gap that we are studying was just that, a gap. It was designed that way. Looking north on Gay Street c. 1900. The Hattie House has been remodeled into the Imperial Hotel (at right). They alley is still visible, though now it features a span across the top. 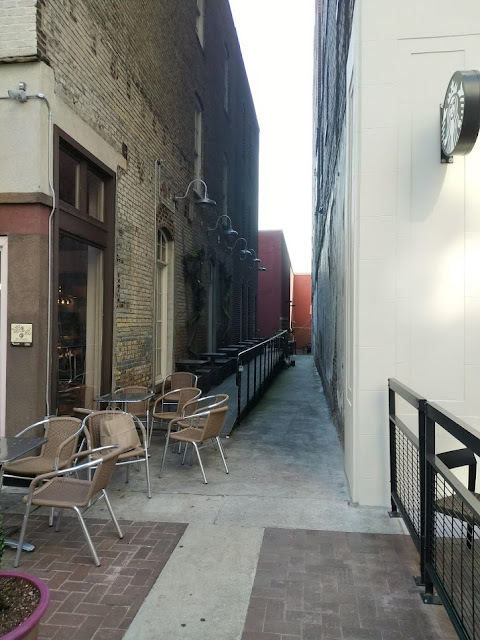 Shortly after 1900, the alley begins to show up as 524 and 1/2 S. Gay Street and is listed in the city directory as "Arcade Hotel." By 1905 it has achieved the distinction of "Annex Hotel" which I take to mean hotel annex. By 1906, it is listed as "American Hotel." In 1908, the annex has been covered and has acquired its first business "Berlin Martin Boot Black." This would seem fitting since a bootblack was a shoe shiner and those often were hotel amenities in the period. By 1916, the bootblack space is simply listed as Hotel Sterling. c. 1917, The Imperial burned in a fire after a lightning strike. The Farragut is being built. The Hotel Sterling is going strong. Note that the "gap" now has a fancy storefront. The alley had become a covered arcade entrance to the Hotel Sterling. Interestingly, inside of this spot which can't be more than 10 feet wide, there was a club room which was used by the Knoxville Lumber Club. The club was composed of "lumbermen" such as E.M. Vestal of the Vestal Lumber Co. They managed to hold their meetings in this small spot. The Hotel Sterling Arcade mid 1920s. The completed Farragut hotel is to the right. Closeup. This photo may depict the final days of the Hotel Sterling. The Hotel Sterling closed in 1927, the owner John D. Anderson having died in November of 1926. Mr. Anderson also owned the Central Hotel at the corner of Depot and Gay, but that's a story for another day. When the hotel closed, the company that owned the Farragut obtained a 99 year lease on the Sterling and its arcade. The person who owned the land under the buildings was none other than Mrs. J. Allen Smith of White Lilly Flour fame. The owners of the Farragut intended to erect a parking garage at the rear of the property and intended to erect a north wing of the hotel where the Sterling stood. Obviously that never happened as the Sterling building is with us today. From 1929 until 1936, the little building in the gap was sublet by Mrs. Minnie K. Little who operated her Little Shoppe, a women's clothing store. Early 1930's when occupied by the Little Shoppe. In 1936, big changes came to the spot. Mrs. Little moved her shop to the second floor of the Farragut, near the elevators and overlooking Gay Street. Hanover Shoes, which was formerly located across the street and temporarily located on West Clinch, moved in. Hanover would be the longest staying resident of the building, staying at the address until 1974. Not surprisingly, Hanover opened a West Town Mall location in 1973. That location lasted well into the 1990's. Hanover Shoes was a national shoe manufacturer and retailer. Based in Hanover, Pennsylvania, Hanover sold its own shoes through a network of hundreds of shoe stores. Most of the ads placed in the newspapers touted that Hanover shoes were "all leather shoes." By the time most of the outlets had closed, Hanover was no longer making its own shoes. A close up of the previous photo. Here you can see that the entrance was set back with large display windows. The Hanover location at 524 & 1/2 closed in 1974. The building was then vacant for 4 years when Office Trends, Inc occupied the space in 1978 and 1979. The building sat vacant again until 1982 when John J. "Joe" Fogarty opened up Fogarty's Awards and Engraving. Fogarty's Awards was an offshoot of Fogarty's Jewelers. The two businesses had been located at 510 S. Gay but the jeweler moved to the Plaza Tower when it opened. Joe moved his business to this little spot and remained there until 1991. "Fogarty's" as it appeared in 1996. The Hanover sign is still on the building. Photo by Roland Kopp. The building stood vacant until 2006 when it was demolished during the 500 block restoration. I spoke to Faris Eid of Design Innovation Architects ("DIA"), the man responsible for saving the S&W building and the Victorian buildings on the block. When asked why the Fogarty's building was demolished, he answered simply that there was nothing left of it to save. More interestingly, he says it was never really a building at all, just a floor platform, a roof, and a facade; truly an alley filled in. The roof was long gone by 2006 and the floor followed suit. All that remained was an iron header beam and some blocks on the face. Mr. Eid provided me with the following photos, which I appreciate very much. Rarely do we get to see the interior of a building as it was being demolished over a decade ago. This was a nifty little spot where Knoxville bought its shoes for nearly 40 years. The minuscule size of the place coupled with the "afterthought" nature of its construction likely led to its demise. 524 and 1/2, the old Walgreens building, a late 1920's Farragut hotel parking garage and a few other State St. addresses were lost in the construction of the new Riviera. While we are always sad to see old Knoxville addresses go, their loss allowed us to keep the S&W, the Athletic House, and the Sterling. At the end of the day, we now have a pretty cool little alley in which to enjoy a scoop of gelato. Not bad! Until next time, as we continue studying the Gaps of Gay Street. Unless otherwise noted, all photos used with permission of the McClung Collection of the Knox County Library System. I was just introduced to your blog and I absolutely LOVE it. So informative and the then and now pictures are unreal. I would love to see a piece on the Daylight Building. I was fortunate enough to purchase a unit in that building and am absolutely fascinated with the history of the building but have not been able to fund much information about the history of the building other than word of mouth.